A while ago I was inspired to make a vintage style cherry print apron. It started when I saw this apron in a magazine and also came across some vintage cherry print fabric at a market. 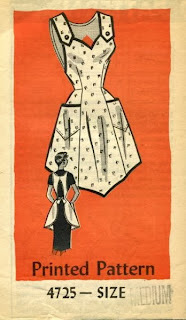 I started looking at pictures on vintage apron patterns to get a feel for what style of apron I would make. These three where the main ones that I ended up used for my pattern shape. I decided to go with a sweetheart neckline and princess seams down the front, with the shoulder straps being part of the centre bodice piece. 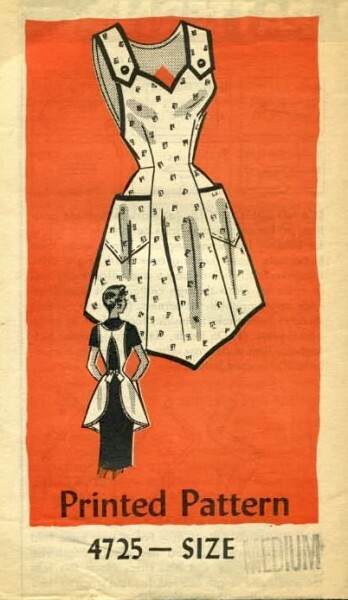 The back is the same as vintage patterns above, with a button up the top and ties at the waist. I decided not to go for pockets and not to have a ruffle around the edge. The pattern process was probably a tad over-engineered, but it had been a little while since I'd drafted something from scratch, so it took a bit for my patterning mojo to kick in. Once I was happy with my muslin of the top half, I drafted the skirt and tie pieces. 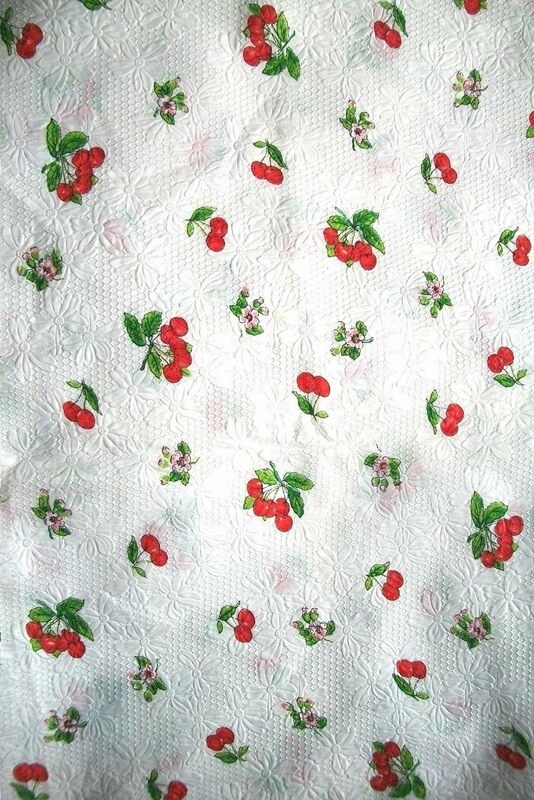 The cherry print fabric I had was cotton and quite light weight. I was concerned that with frequent use and washing it would tear easily, so I decided to back it with some white cotton duck I had in my stash. I cut out the pattern pieces in each fabric and then used the overlocker to sew them to each other and finish the raw edges. I then proceeded with the construction of the apron. As the cherry print isn't as bold as the original source of inspiration, I decided that it needed some trim to make it "pop" a bit. I used red bias tape around the edges and across the waist seam. For the button closure at the back, I decided to use a fabric covered button. I played around with both a cherry print and plain red fabric button and decided the plain red button looked better. The button hole is bound with red bias tape to match the edging.